Well, I’ve had a lot of fun races so far this year if only because the people I went with were all fun. But really, after Gasparilla, most of my training and racing was focused on getting to October, November, and December. Last month was the Twilight Zone Tower of Terror 10 Miler. Next month is the Space Coast Marathon. But this month, and this weekend, is TriRock Clearwater. TriRock is owned by Competitor and they’re the same people who do the Rock’n Roll Marathon series. This is a pretty new race (only in its second year here in Clearwater) but the course is awesome and something I’ve trained on many times. I prepped all my gear yesterday, which is both good and nerve wracking. 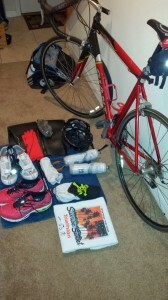 I still am uncomfortable with the setup process for a triathlon because there’s so many things I can forget. I need my swim gear, my bike gear and my run gear. My process for prepping is to basically get the gear ready by segment. 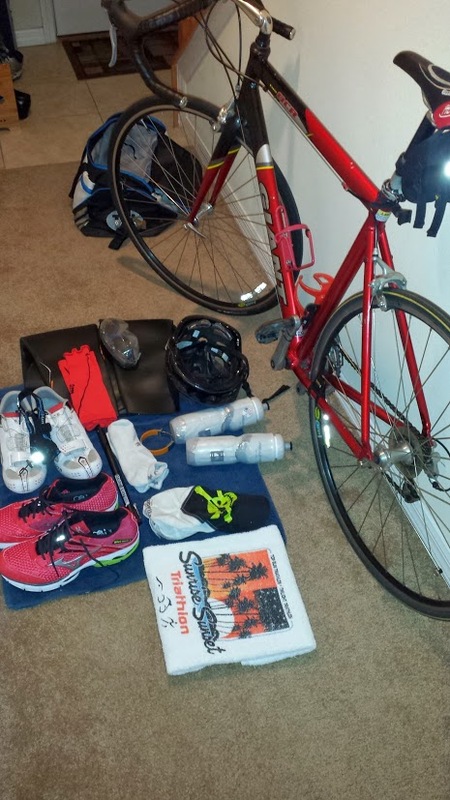 First the swim gear, then the bike, then the run. So I should be ok but I’m convinced things are going to evaporate out of my bag! Speaking of which, I need a bigger gear bag. Mine barely fits my stuff. Today will be a nice rest day. I didn’t have to work out or wake up early this morning. After a nice breakfast at Oxford Exchange with Melanie, her sister and brother-in-law, I’ll head over to Clearwater to do packet pickup. I also am in the market for a new bike and I’m very interested in one I found by a brand called Kestrel. They’re a less known name but the research I’ve done on them seems to show they’ll be a good bike. Component wise, they have the stuff I’m looking for with Shimano 105 equipment on board. The price point is hard to beat. There’s a shop really close to the expo that is a Kestrel dealer and I’ll be checking it out too. After that, I’ll be at a food and music festival today. Unfortunately, I won’t be able to enjoy the beer but I’ll definitely want plenty to eat! My plan is to just enjoy some good music, good food, stay hydrated and just enjoy hanging out with everyone until I have to leave, probably between 9 & 9:30, to get home and go to bed. I don’t think Melanie and everyone are even staying much later than me so I won’t miss much of the concert. I’m feeling ready and pumped. I don’t think I can PR this race which will break my string of 9 straight PRs the past calendar year. I don’t care though, I just going to enjoy myself and see how good I can do!